Our second instrument came about after Mercer University sold a large Schantz organ. Professor of Music and University Organist Bob Parris asked us to propose two small organs for its music department. 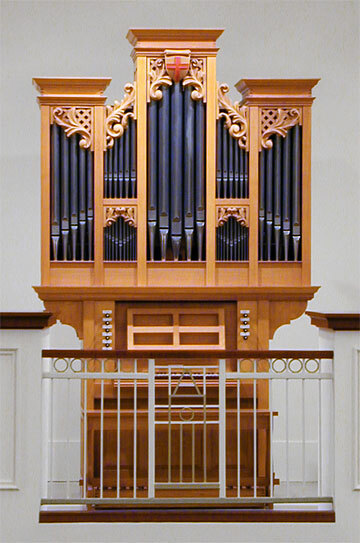 This organ, with its current location in a new music building recital hall, enjoys the happy circumstance of having the room designed around it rather than the more typical reverse. Opus 2, with its one manual and meantone temperament, complements and expands the organs already at the disposal of Mercer students by focusing more clearly on sounds and techniques of early keyboard music. Historic lead alloys for interior pipework and a vocale style of voicing combined with very favorable acoustics of the recital hall produce a convincing reproduction of ancient sounds.